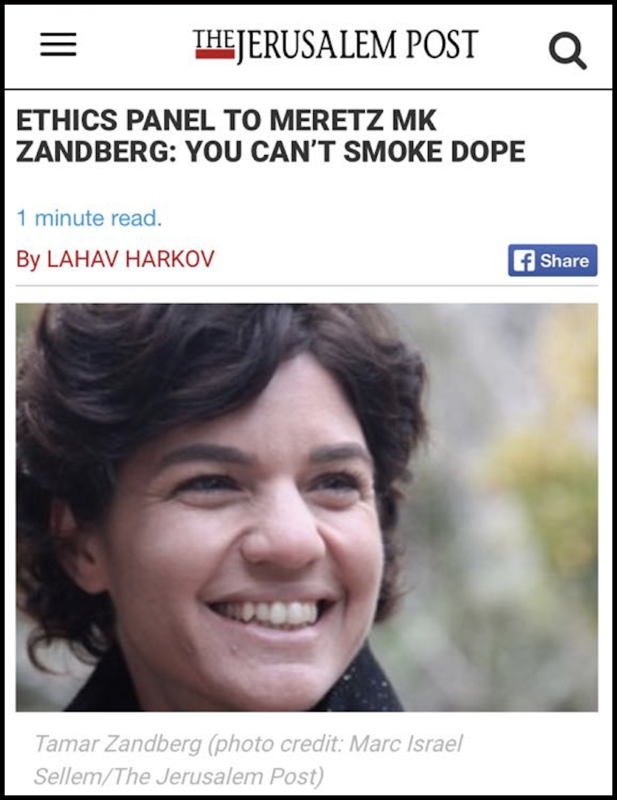 But if you think our friends at Meretz were going to simply roll over and give up, well, you’re wrong. The Party issued a stern rebuttal to the Ethics Committee, signed by all of their MK’s, and delivered at a Press Conference this afternoon at the Yafo Flea Market. Danny then reached under the podium to get the Party’s latest press release on increasing voter participation, only to find that he’d misplaced it. But he was positive that it contained the following phrases: “It worked in Holland“, “commune in the Arava“, “windmill“, and “hemp seeds“. Tel Aviv, Florentin: The State of Israel is currently losing patience with the fact that you still haven’t given them a complete synopsis of your Midburn experience, starting with your Camp’s months of preparation and ending with you driving your filthy car home to Tel Aviv. Midburn is Israel’s answer to Burning Man, and attendees are normally about as reluctant to overshare as a Vegan who does Cross-Fit. Anyhoo, The Daily Freier spoke with several of your friends, neighbors, acquaintances, co-workers, relatives, and exes to get their feelings about your critical failure to tell them everything about your Midburn Camp already. “Wait, did the sand end up EVERYWHERE?” asked your Boss at the Startup. “That’s just CRAZY!” Later, your boss confided that you showed him fake tickets to Berlin for a fake Tech Expo because you didn’t want him to know that you were just going to go hang out in the desert and hallucinate/blow bubbles/wear a costume that looked like something from Return of the Jedi. Meanwhile, this year’s inaugural Nefesh B’Nefesh camp at MidBurn was met with controversy after 7 Americans who had extended their Taglit trip to attend MidBurn woke up from 8 hours on mushrooms only to find out that they had signed Aliyah paperwork and were about to start Ulpan in Afula as part of the organization’s “Go North Program“. *Special thanks to alert citizen-journalist Eric Narrow who contributed to this story. 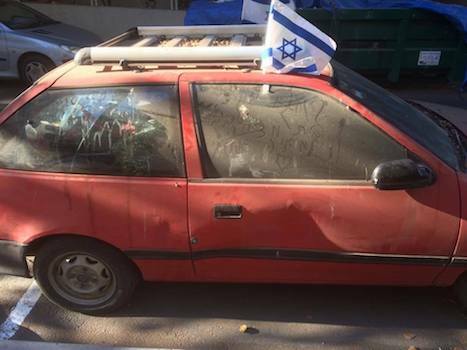 Tel Aviv, Maze: So the guy down the street with the filthy car has now come up with an ingenious plan that does not involve actually cleaning his car: subtly letting people think that he just got back from Midburn down in the Negev. 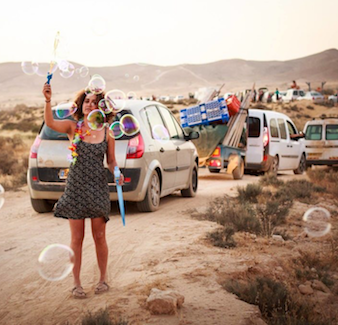 Midburn, the Israeli version of Burning Man, ended last Friday. And Midburners are pretty excited about…. TELLING YOU THAT THEY WENT TO MIDBURN. So everyone who was there is currently telling their friends, relatives, lovers, ex-lovers, supermarket cashiers, cab drivers, former roommates…. basically they are telling EVERYBODY that they just got back from Midburn. And one of the coolest ways to tell people you went to Midburn without actually telling them is to drive around town in your dust-covered vehicle, fresh from the desert. So the guy down the street? You knew something was up when he started walking to and from his car carrying an umbrella, hula hoops, and light sticks. Also he is suddenly wearing cowboy chaps and a hat made of feathers. And what’s up with the sun goggles? It’s all rather Mad Max Thunderdome. Yet it appears to be working, as he is currently leaning against his car and chatting up two lovely Dutch tourists who seem to be totally buying this סיפור משוגע. This is crap. It’s like he is just making up sentences using random words like “facepainting, dreadlocks, swing-set, amazing DJ from Luxembourg, sunrise, shaman, hydrating, sense of community, moccasins, and unicycle.” And once again, the biggest insult is that it appears to be working. Not only are the beautiful Dutch guests impressed, but a hand-painted VW van just drove by, honked, and gave him the thumbs up. Well played, fake Midburner. Well played.